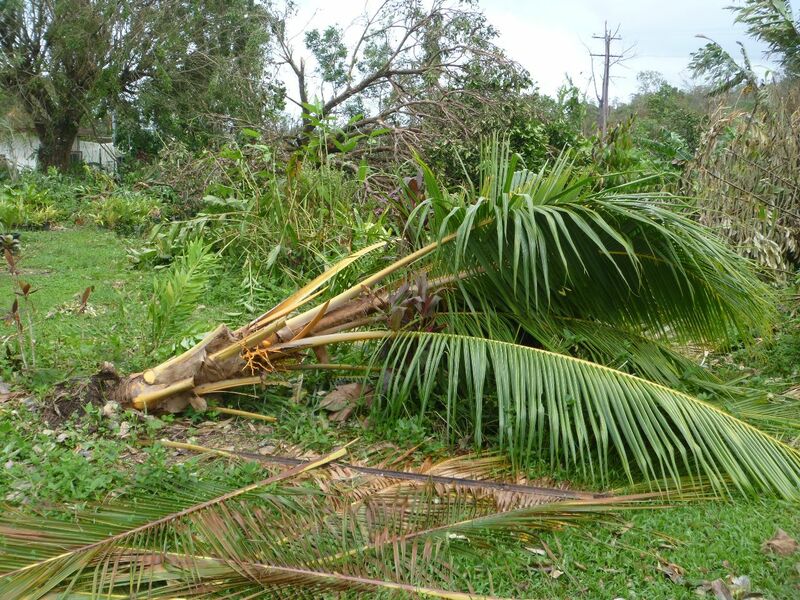 Forum: Coconut Palms In NSW? 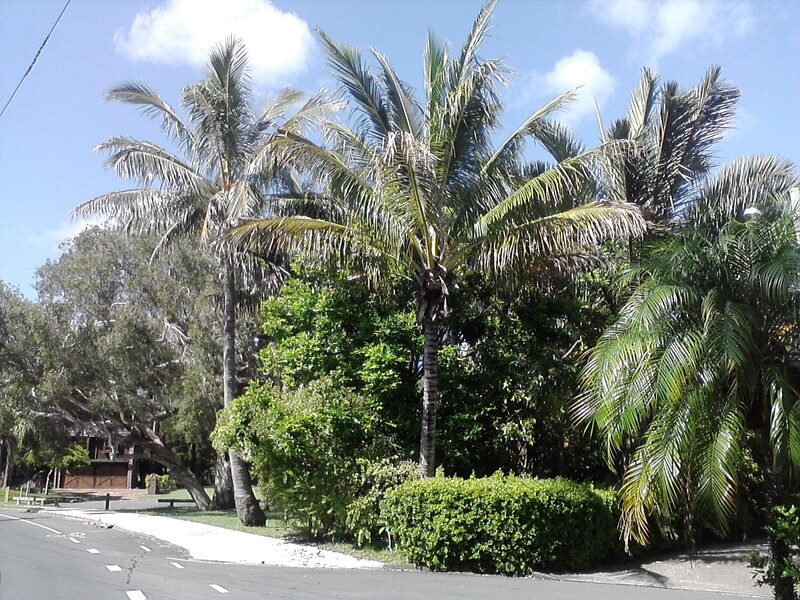 Have observed coconut palms growing quite happily at Byron bay,and fruiting as well i might add.I asume because of the extreme southerly location that it takes years to get to the fruiting stage, if at all in some cases. Coconut -the most useful tree in the world and one of my all time favorites. I'd say from my experience that Gold Coast to Byron Bay area would be the southern limit for fruiting of coconut. Growth of the trees this far south can be painfully slow and fruiting unreliable, with nuts often not forming meat fully covering the inside of the shell. Also the nuts often tend to be sort of football shaped making it difficult to scrape out the meat to make milk/cream. Quality can vary a lot from year to year. Most of the trees observed didn't appear to have been given much attention or care re. fert, watering etc. Some trees on the Gold Coast, however do fruit regularly with well shaped nuts. 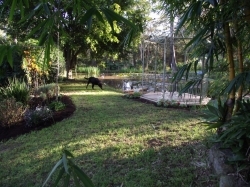 These would be the trees to select from to grow new trees to try in Mullumbimby. For the best chance of success around Mullum, select an elevated site (up off the flats) out of the frost, north or north-easterly facing slope well protected from cold southerly winds in a rich well drained soil and keep well fed and watered. Plant as many as you have the space for in a mixed fruit garden. They could take 20yrs to fruit maybe 10yrs if they're looked after, who knows? It'd be a worthwhile project though. Best choice for southern growers would be the dwarf fruiting varieties . A local DPI guy has built up a range of many different types up here . First fruits often sit on the ground ! These bear much earlier than the normal tall types , and are excellent drinking types , tasting very sweet . 'Malay dwarf' and other simmilar dwarf varieties may be , so I've heard, more sensetive to cold. Their compact size however, would enable a southern grower to protect them more easily with climate shelter, and also potentially longer fruitful life down low out of the wind. Worth a go for sure. And guess what, I live about 400m from this house. The looks healthy enough. 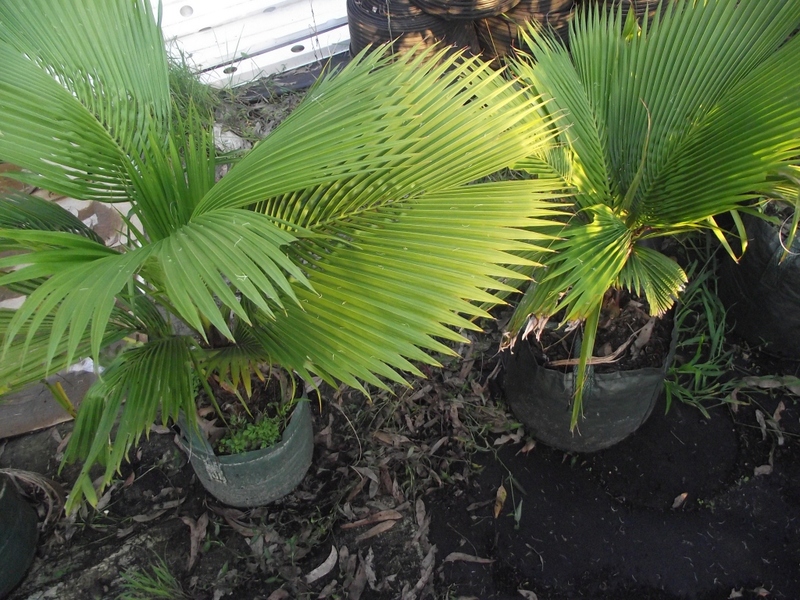 Hi folks, according to a coconut expert in florida, the coconut palm growth stops at 48F. At 55F to 80F the growth increases 5 fold. Hotter than that and you may need a water supply. Cold tolerance may vary a little from that. Good luck at converting those figures to Celsius. I am growing nuts without husks whenever I see them in stores with a hint of a sprout. I planted a small sprouted nut when I first shifted here 5 years ago . I got fruit from a mate with lovely Malay Gold dwarf , the small plant is 2 years old . 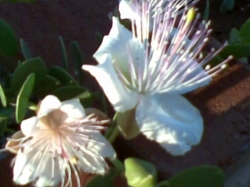 Another 3 years and I have the first flower , hopefully some fruit next year. 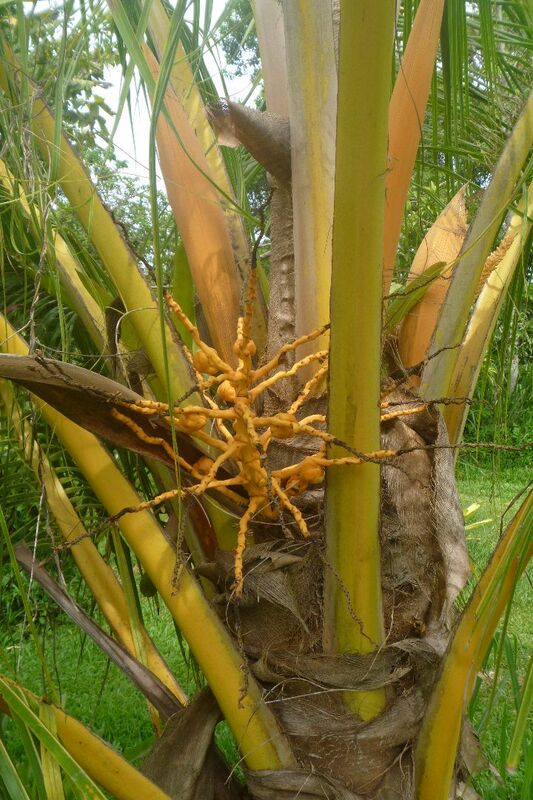 Where can i buy dwarf coconut palm tree, that will fruit? Nowhere , they will not fruit in Sydney . My tree blew over in yasi , and I have gradually jacked it up top approx 30 degrees. I'm interested in getting a couple of dwarf coconuts, the green and the yellow varieties if they are available to buy, can you help with this please, if so what is the price and the postage for a couple of trees? Keep your eye out here at Daley's also. They sell named varieties from time to time as well and can send them to your door via courier. 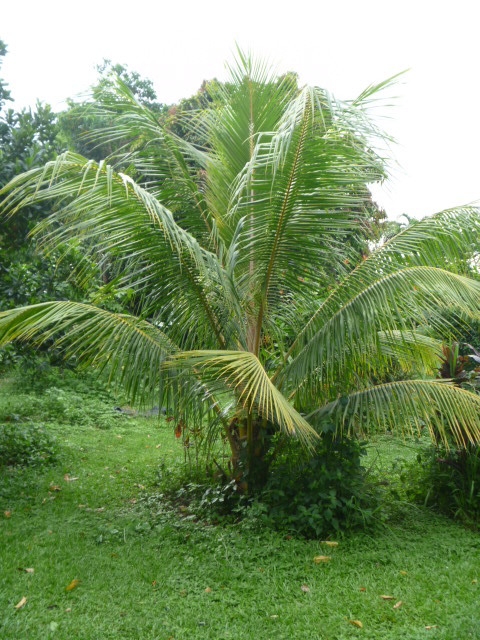 Here's the link to Daley's coconut plants, there's none for sale as at 25 June, but. as I said, they do come up for sale from time to time. Thanks John, I'll check the link weekly and hopefully they'll become available soon. 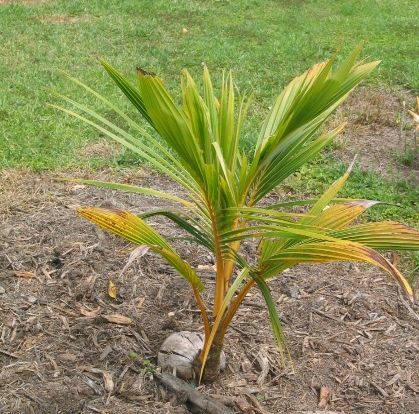 There is a yielding palm at diggers camp south of yamba, found on the beach and planted. Taken 2 years for mine to get over Yasi .. flowers galore .. Recently found out that mine may be "Forest" Coconuts. Each frond leaf has a window starting at the base of the frond rib that gets longer as the plant matures till the frond leaves separate totally. Apparently, they flooded the market a few years ago when a specialist nursery went broke. No wonder the retail nurseryman couldn't tell me the cultivar. Can anyone confirm this for sure with the pic shown? Orania palm? When I went to Mount Lewis in FNQ I thought who planted all the weird coconut seedlings around the old tracks up there. Turned out to be Orania. Maybe these are the forest coconuts ? Some Oraniopsis appendiculata down here at near sea level . So slow and yes very rare in cultivation.Beccariophoenix madagascariensis are as common as muck in comparison .. many planted on median stripes in middle of road into Cairns . Coconuts require a mean temperature of 20�C or higher. Nut-bearing specimens grow at Coolangatta, 28� 10′ S and I've seen palms grow well at Yamba, NSW, 29� 26′ S. Seaworld on the Gold Coast, 28�S, has numerous mature coconut palms many producing a good crop of nuts each year, but while some produce well others don�t seem to progress far beyond the flowering stage. I have shot many coconuts at my home in Southport. It takes 15 years plus for viable nuts to be produced at 28�S latitude. Choose a nut in which you can hear water slosh when shaken. 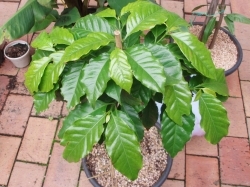 Does anyone know if I can get coconut seedlings in Perth? Hi I am visiting Gold Coast in the coming week do you know if I can get some coconuts for drinking and small tree to grow from? Hey, anyone know a place to buy coconut shells (waste)??? Behind the service station a k or so before Port Douglas turn off is a dealer in coconut products .. mate would buy a big trailer load of coconut husks to age and chop up for potting media additions . 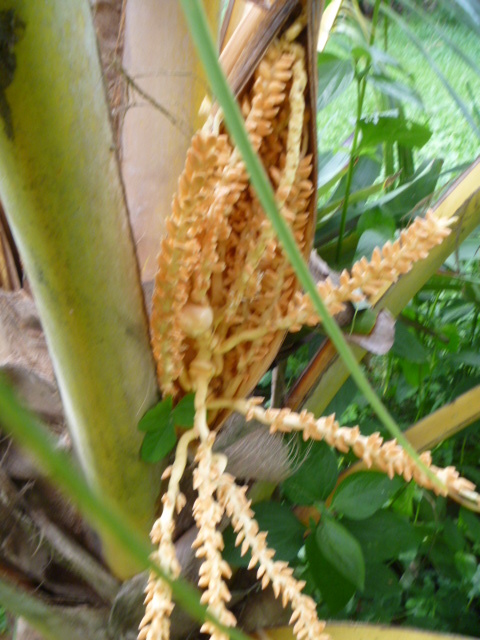 I just saw that palm growing in Goodna, read the article and am amazed and am amazed. I always thought there was no hope for growing down in northern rivers, but it has been rekindled. Is there any way you think I could get in touch with the owner for some nuts and try to breed one that would consistently do well here. It may never work, but just seems like a lot of fun to me. 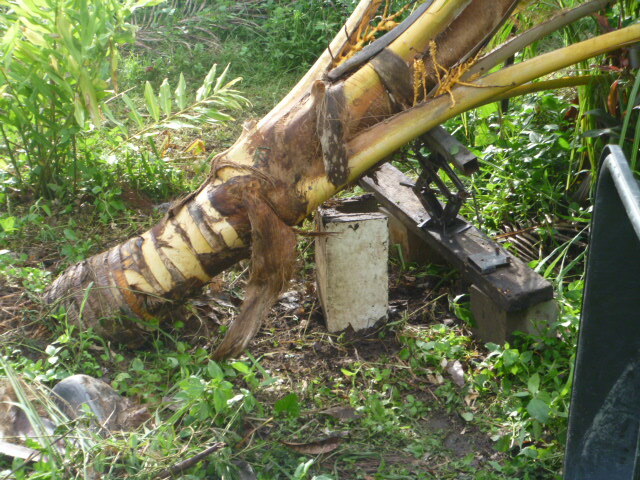 As with many really tropical trees, it is the first 2 to 5 years that are critical and then they get more hardy. Start them off in a temporary cover with great soil not getting too wet. Hi Wampa, where did you get your coconut plant from please? Heya - I want to buy some of your coconutsCactus Island but I can't contact you... Please advise! If you click on 'shop' on top left hand side you should be able to contact Daleys.